"Love Shack" is well equipped for liveaboard or long range cruising. Sleeps 4 in 2 stateroomns, the dinette sleeps 2 to accommodate 6 owners/guests. There are 2 owner and guest staterooms including 2 guest heads and 2 guest showers. Off-set double berth forward with drawer and hanging locker storage. Aft to starboard-side common head with hand-held shower. Aft to port-side down galley. Across to convertible dinette. Up and aft to main salon with starboard-side helm, slider with access to walk-around decks, port-side breakfast bar, starboard-side L shaped settee with teak table. Down and aft to the master stateroom with center line queen berth, hanging locker and drawer storage along with ensuite head with a stall shower. Aft stair access from main salon to raised fully enclosed aft deck area with hard-top. Three steps up from aft deck is fly bridge area, also fully enclosed. Satin varnished yellow ribbon teak interior, and a teak and holly sole throughout the interior. 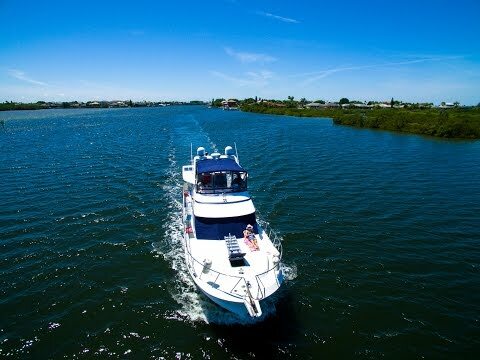 On her second owner, "Love Shack" is well equipped for liveaboard or long range cruising. She is the vessel depicted in the original Heritage East 42 brochure. File photos presented until current photos available.